The Spanish financial sector is taking place in recent times, the biggest bank consolidation has become known in our country, not yet finished with Banco de Valencia, Catalunya Caixa and NCG as the great challenges ahead of this year 2012. All these movements are reflected in the communication strategies of the new entities with the disappearance of some very active: Banca Civica for the recent takeover by CaixaBank, or CAM by Banco Sabadell, others who had recently started like Unnim acquired by BBVA and finally others who have not posted yet on this channel as Banco Pastor taked over by Banco Popular. This dynamism of information has made that the total volume of fans and followers of the banks in the period January to March 2012, has grown by 20.9% in Facebook going from 286.225 to 345.933 fans and 16.1% from 62.622 Twitter followers in December 2011 to 73.184 in March 2012. 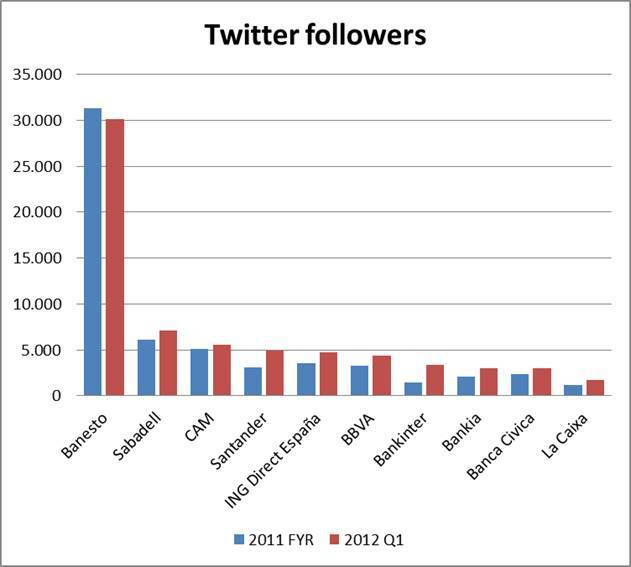 If in the last 2012 was Banesto who led the ranking, in 31 March 2012 ING has taken the lead, with 32.200 new brand followers (24% growth). His campaign "Take them to school" or the more recent "Who loves you more?" Have contributed significantly to the incontestable climbing in the ranking. ING is the internet bank with a more determined commitment by integrating social media into his external corporate communication strategy and most likely in the not too distant in their internal communication. 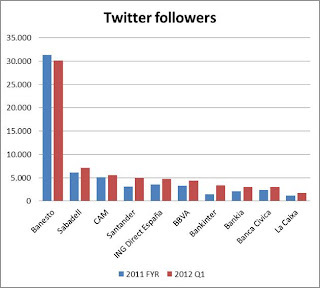 On Twitter, all entities are betting in a clear and forceful hereby as an additional channel of communication with its customer base.The ranking remains unchanged in its first three positions, with the clear leadership of Banesto followed closely by CAM and Sabadell, who as a result of their merger will combine profiles perhaps in the next quarter. 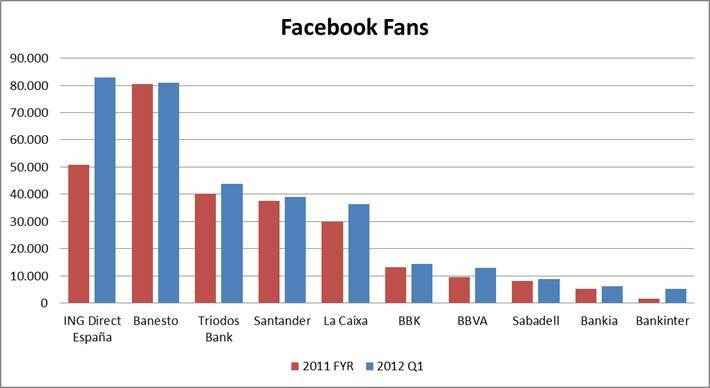 Highlighting the rise of Santander to 4 th place and moving ING Direct BBVA to 5th and 6th place respectively. Bankinter by his side double its base on a 127% increase going from ninth to seventh. As for the uses that remain mostly unchanged as was largely discussed in the previous quarter ranking, customer information and support to the presence on other social networks are the main goals for Social Media presence. Customer Care requests management, query & complaints Can 24. Promote the activities of the social works of the savings banks, highlighting the actions of Caja Madrid with La Casa Encendida and communities of artists and creators. Focus on the youth segment of the market because of its greater affinity with the sectort: Banca Civica, Caja Rural de Navarra, LKXA. Preferential atention on entrepeneurs with specific pages and blog: Banesto, BBVA, Santander, La Caixa.